With most Visualization Types and Datablocks, you can add up to 6 Date Ranges. 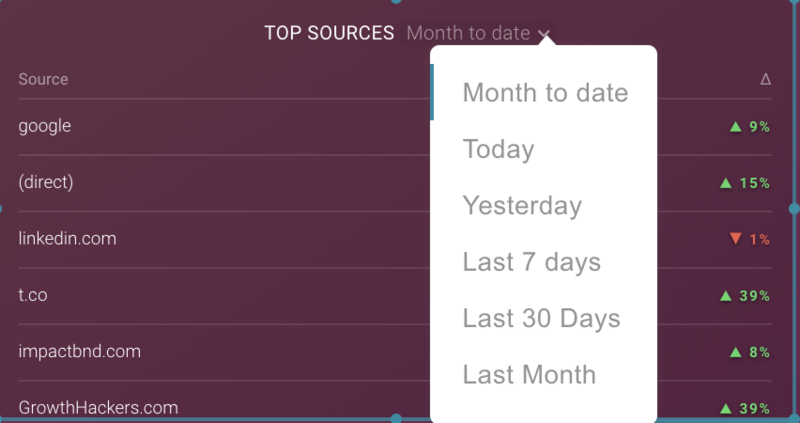 From there you can switch between the Date Ranges to view your data over different time periods. Each Datablock has a primary Date Range which is designated by the (1) to the left of the Date Range name within the Properties Panel. Use the instructions below to add additional Date Ranges to your Datablocks. Hover over the Databoard you would like to focus on and click on the Edit icon. This will open the Databox Designer where you can add additional Date Ranges to your Datablocks. Click on your desired Datablock (A) so that the Properties Panel appears (B) on the right hand side of your screen. Under the Date Ranges (C) field click on “+” button (D) next to the input field. Add intervals from the dropdown list, such as Last Month and Month to date. Databox supports a wide selection of predefined Date Ranges: Today (1D), Last 24 hours (24H), Yesterday (-1D), Week to date (WTD), Last 7 days (7D), Last 14 days (14D), Month to date (MTD), Last 30 days (30D), Last Month (-1M), Quarter to date (QTD), Year to date (YTD), Year (1Y) and All time. The Date Ranges available for each Metric is based on what we can access through the Data Source's API. 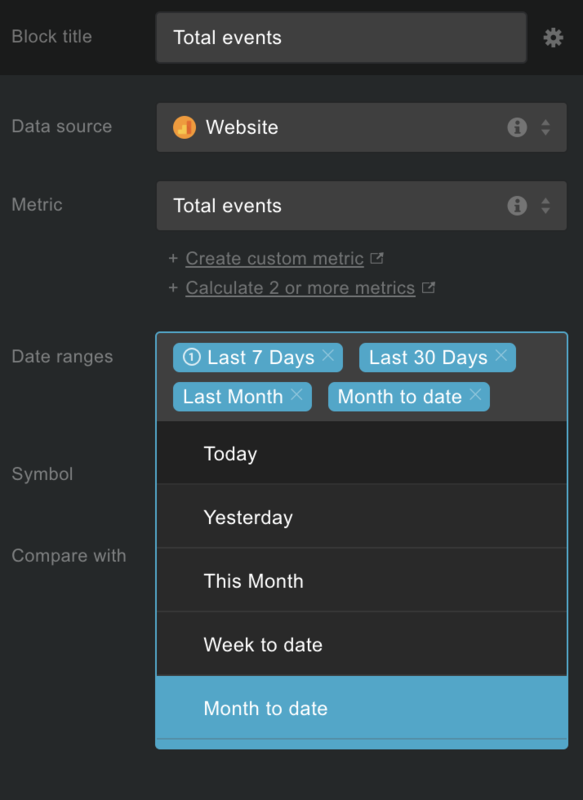 To see what Date Ranges are available, navigate to the Metrics screen. Once you have added your additional Date Ranges, you can easily switch between them by clicking on the Datablock title arrow.